This is not about B.B. King, may he rest in peace. This is about the color blue. And food. Rice. Their blue rice comes out a shade that varies from forget-me-not to—if photos are to believed—something much more saturated, more purple, closer to a deep periwinkle. It’s called nasi kerabu and I discovered it in WikiTravel’s list of recommended eats for Kotu Bharu before we crossed the Malaysian border. 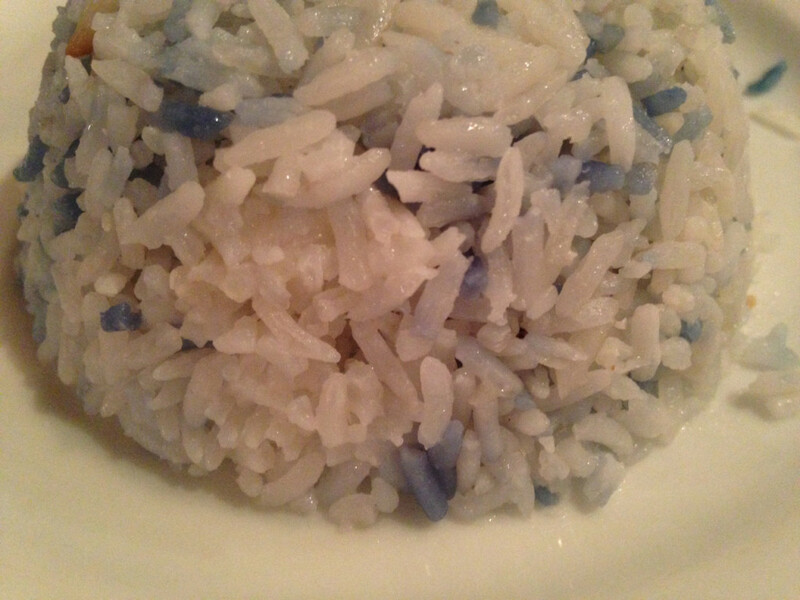 Traditionally, it’s prepared by boiling the rice with butterfly pea flowers. Today it can be prepared with an extract from the flowers. And of course, because there’s better living through chemistry, artificial blue dyes have made their way into some less-than-honest kitchens. As with all blue food, nasi kerabu was a bit more illusive than I wished. There were signs for it all over Kotu Bharu, in text and with sun-faded pictures, but in all the places we inquired, we were disappointed. Flowers out of season? All stocks gone to the big, wealthy cities of George Town or Kuala Lumpur? Those questions exceeded our Malay and everyone else’s English. The big, wealthy city of Kuala Lumpur proved our savior. And a surprise find in Chinatown saved us the challenge of navigating to KL’s satellite communities where the imported cooks from Kelantan could afford to open restaurants. We enjoyed nasi kerabu at the Old China Café. It’s no surprise that a joint in Chinatown would serve rice, but a bit incongruous that a place with ‘China’ in the name serves a small array of truly Malay rice dishes, like our blue quarry and nasi lemak, which is rice cooked deliciously in coconut milk and pandan leaf. Nasi kerabu is a little eerie to look at, actually. In his ‘blue food’ monolog, George Carlin never talked about the surprise of seeing blue food outside of a chemical factory or candy bin. 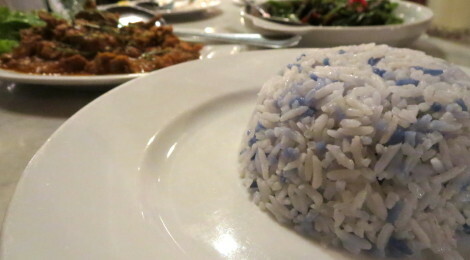 It speaks to the difficulty of cooking the dish or procuring the flowers that our nasi kerabu—a side to lovely meal including beef rendang—was clearly a mixture of blue-tinted grains and plain white rice. A close-up of our nasi kerabu showing the variance in color of individual grains. The variety probably attests to a natural coloring process, as we suspect a less-than-honorable cook would make a bolder statement. Click the photo to enlarge. Our dish did not have strong flavor, and I wonder if, in a blindfold test, I could have said it was any different than steamed rice. It was nonetheless beautiful. My gaze kept falling away from Alison to our dish of rice. I was worried my wandering eye would get me in trouble, until I realized that Alison, too, was staring at the rice. 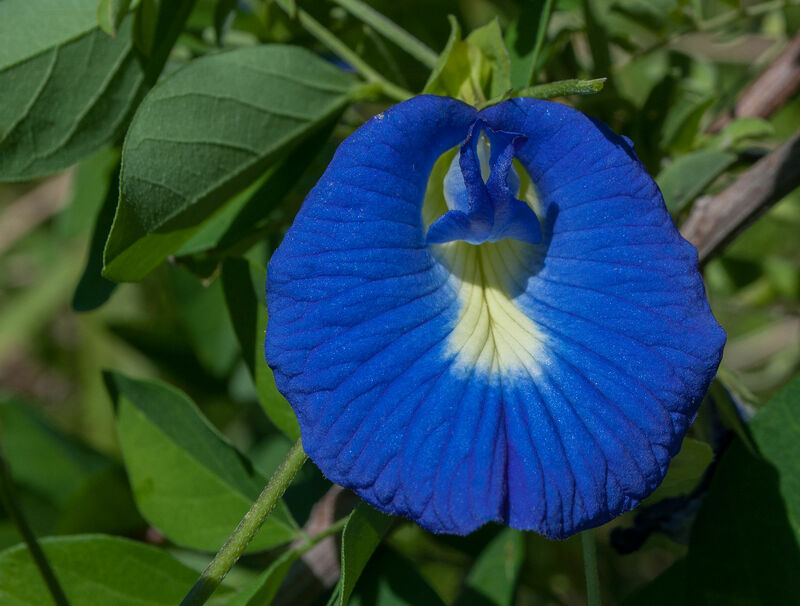 Given the trouble we had finding nasi kerabu, it’s no surprise we didn’t have a face-to-face encounter with the wily butterfly pea flower. We are thankful for the photograph that Sengut2006 provided to Wikimedia Commons.